All basically just varying degrees of certainty. Referring to his friend Fred Rogers in his book I’m Proud of You, author Tim Madigan writes “another time he wrote that he had discovered the South African word ubuntu, which means: I am because we are. "Isn't that lovely!" he said. "My identity is such that it includes you. I would be a very different person without you." … and later is told of a prayer by a minister named Harry Emerson Fosdick: "We confess before Thee that if life were all smooth, there would be no patience; were it all easy, no courage, no sacrifice, no depth of character. We acknowledge before Thee that what is most admirable is the child of adversity and of courageous souls unafraid to face it." Let's get better at accepting our fallibility - let’s better understand that it is entirely natural to develop stories based on our most current information; that all humans tend to build a narrative that fits into what we already lean towards. “Miles was such a good bandleader had so much to do with his “lack of” communication and his superior eye for scouting young talents. Improvisation is nothing but being FULLY aware of your surroundings, having control of the language/literature/history and be WILLING to go where the music is going, not forcing it go where you think it wants to go but letting go and trusting that the music will take care of itself. By trusting in your self and your - let’s say - team, you may open up a door that you, your team and the audience was not expecting. I’ve been beating the RHYTHM and COORDINATION drum for a while now, and will continue to direct my research towards this (see my brief notes on entrainment last week). It is no accident that the best athletes, musicians, dancers, etc. are the ones who have the superior RHTYHM. Instead, focus should be on rhythm, COM, balance, coordination, where you feel forces, etc. People are scared to add resistance to a movement, because they fear that it will upset timing. But perhaps it is the opposite; whereby, you the heavier implements force you to find the timing. Also - Clayton told a great story about Bahamas high jumper Donald Thomas. Worth the listen to the podcast just for this story. Take-home: Look at what the athlete is doing, and SLOWLY adjust-improve based open how he moves. This way of thinking forms the background of my ‘Key Words’ posts from last year; rather than teaching positions, teaching through concepts and objectives. The simplicity of a well-chosen word allows the athlete to provide their own unique context … with the end-goal of a more efficient retrieval system, whereby technical reminders ‘bypass’ the software, and are instead injected directly into the hardware. Dan Pfaff sends out articles to folks in his network every week or so. This past week he sent me an older one from the Art of Manliness that I hadn’t previously seen. 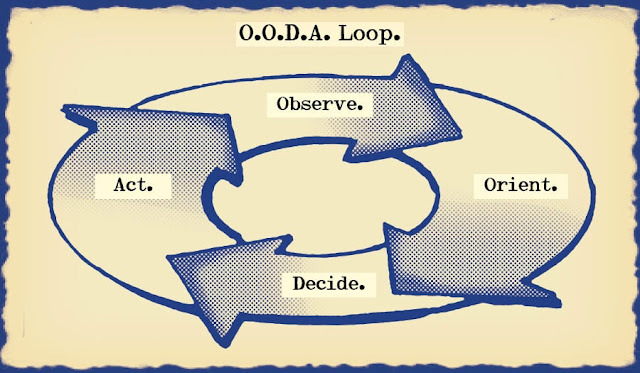 Possibly the best review of the OODA loop I have come across, authors Brett & Kate McKay have written a fairly comprehensive overview of John Boyd’s famous decision-making process, that has recently become more popular in management circles. Gödel’s Incompleteness Theorems: any logical model of reality is incomplete (and possibly inconsistent) and must be continuously refined/adapted in the face of new observations. Heisenberg’s Uncertainty Principle: we cannot simultaneously fix or determine the velocity and position of a particle or body. We can measure coordinates or movements of those particles, but not both. As we get a more and more precise measure of one value (velocity or positions), our measurement of the other value becomes more and more uncertain. The uncertainty of one variable is created simply by the act of observation … even as we get more precise observations about a particular domain, we’re likely to experience more uncertainty about another. 2nd Law of Thermodynamics: Boyd infers that individuals or organizations that don’t communicate with the outside world by getting new information about the environment or by creating new mental models act like a “closed system.” The more we rely on outdated mental models even while the world around us is changing, the more our mental “entropy” goes up. Similar books include Greg Ip’s Foolproof, Taleb’s Antifragile, Gall’s Systemantics, and Tetlock’s Superforecating. One of the original writings in complex systems is Systemantics: The Systems Bible; a fun, and interesting read, that has a lot of take-homes for coaches. There is a lot of similarities between Boyd’s OODA Loop and Gall’s work. Gall’s book has also been used as a primer on heuristics. I wrote a few short pieces last year on coaches’ use of heuristics to improve our practice. I discussed Kahnemann’s System 1 (intuition) and System 2 (reasoning) thinking, and its relation to coaching and decision-making. An argument of some ’old-school coaches’ (of which I am quickly becoming one) is that younger, more ‘science-based’ coaches, have not developed the necessary ‘feel’ for coaching; their System 1 thinking has been retarded by the over-reliance on System 2. A problem with this argument, however, is that often our first impressions are wrong - and are far more susceptible to biases than well-thought through reason. That being said - the nature of coaching requires that we make strong, FAST decisions; most of the time - at least on the field of play - we do not have time for patiently thinking things through. However, it is imperative that we base our intuitive decision-making abilities on well-thought out reason and experience; only the experience of years of actually coaching athletes in the trenches will give us this insight. It is meant as an explicit representation of the process that human beings and organizations use to learn, grow, and thrive in a rapidly changing environment — be it in war, business, or life. Sometimes, rather than spending a week or two reading a book, I will hop on to the Blinkist app, and get through a bunch of books in an hour or so. If I really enjoyed one, then I will buy the book, and dive a little deeper. I will also quite often read reviews of books; good ones are super-efficient ways of getting most of the information without having to devote the time necessary to read the whole thing. Andy Clark’s Surfing Uncertainty, detailing the Predictive Processing Model. is probably not a book I would have bought - but I enjoyed Scott Alexander’s review all the same - all be it, it was overly long. I almost stopped here. I mean - how much more can be said? As these two streams move through the brain side-by-side, they continually interface with each other. Each level receives the predictions from the level above it and the sense data from the level below it. Then each level uses Bayes’ Theorem to integrate these two sources of probabilistic evidence as best it can. The result is perception, which the PP theory describes as “controlled hallucination”. If you remember my thoughts on the Anil Seth TEDTalk and Sam Harris podcast; this is also how Seth described consciousness. A more ambiguous example of “perception as controlled hallucination”. Here your experience doesn’t quite deny the jumbled-up nature of the letters, but it superimposes a “better” and more coherent experience which appears naturally alongside. Clark then goes into considerable detail on a number of sections of the book. I won’t cover all of them. Attention. In PP, attention measures “the confidence interval of your predictions”. High attention means that perception is mostly based on the bottom-up stream, since every little deviation is registering an error and so the overall perceptual picture is highly constrained by sensation. Low attention means that perception is mostly based on the top-down stream, and you’re perceiving only a vague outline of the sensory image with your predictions filling in the rest. Priming . if you flash the word “DOCTOR” at a subject, they’ll be much faster and more skillful in decoding a series of jumbled and blurred letters into the word “NURSE”. This is classic predictive processing. The top-down stream’s whole job is to assist the bottom-up stream in making sense of complicated fuzzy sensory data. Learning. We create models that generate sense data, and keep those models if the generated sense data match observation. Models that predict sense data well stick around; models that fail to predict the sense data accurately get thrown out. Motor Behavior. Clark concludes: it’s predicting action, which causes the action to happen. With predictions about proprioceptive sense data (ie your sense of where your joints are), there’s an easy way to resolve prediction error: just move your joints so they match the prediction. “Perception, cognition, and action – if this unifying perspective proves correct – work together to minimize sensory prediction errors by selectively sampling and actively sculpting the stimulus array. This erases any fundamental computational line between perception and the control of action. There remains [only] an obvious difference in direction of fit. Perception here matches hural hypotheses to sensory inputs…while action brings unfolding proprioceptive inputs into line with neural predictions. The difference, as Anscombe famously remarked, is akin to that between consulting a shopping list (thus letting the list determine the contents of the shopping basket) and listing some actually purchased items (thus letting the contents of the shopping basket determine the list)” - Friston, et. al.